Viktor Yushchenko's speech before a joint session of Congress and his award at the President John F. Kennedy Library surpassed honorary status. Each event was a symbolic, demonstrative act indicating that a country exploited for three hundred years is now recognized in its own right as a sovereign nation on the world stage. No doubt the Kremlin and Russophiles bristled knowing that the United States welcomed someone from "Little Russia" in such a respectful, extraordinary manner. Ukraine has finally moved outside the political, economic and psychological shadow of its cold, dark, northern neighbor. The Boston Globe quoted Ukrainian-American Stephanie Majkut who succinctly reflected, "I'm finally seeing freedom in Ukraine. We're finally going to get the Russians off our back. We won't be persecuted anymore." Caroline Kennedy, daughter of the former president, presented Yushchenko the Profile in Courage Award noting, "for those of us who are free, he has reminded us that we can never take our freedom for granted. And for people with no voice in their own government, President Yushchenko and the Ukrainian people have given them hope." As the representative for the Ukrainian Autocephalous Orthodox Church of North and South America and delegate of His Eminence, Metropolitan Michael Javchak Champion, at the ceremony, I heard President Yushchenko say, "I could not calmly watch as the hopes of [Ukraine's] citizens were replaced by disillusion, as millions of people were forced to look for work abroad, as oligarchical clans stole the national wealth . . . with every cell of my body, I felt that millions of honest people were behind me, that we could win, that we would undoubtedly win." He continued, "Ukrainians today are ready to relive the words of John F. Kennedy: 'Ask not what your country can do for you, ask what you can do for your country.' We have the same desire to free Ukrainians from poverty and encourage justice and the rule of law. We want to make Ukraine one of the leaders of democracy." "This is so historic," said Arnie Arnesen, a guest, long time friend and 1992 Democratic nominee for New Hampshire governor, now a nationally renowned radio and television commentator (www.ArnieArnesen.com). Arnie, the most intellectually honest commentator in America, who takes Democrats to task equally with Republicans, was so moved by the event that she took an orange daisy from one of the many vases at the reception to dry and keep with the program booklet. I removed the orange ribbon from my lapel pinned with a trident to give to Arnie so that it would be kept with her flower. "This is an amazing day," repeated my friend of Italian and Norwegian heritage. "Amazing, historic day." The following day Arnie had the UAOC as a guest on her radio program to discuss the ceremony and Ukraine's emerging geopolitical role in Europe and the world. The Profile in Courage award shares the name of President Kennedy's 1957 book. The Kennedy Library presents the award to a select few who demonstrate rare courage and conscience in times of moral and political danger. Although it can be taken for granted that an event featuring a world leader receiving such an award is historic, this was different, especially when it comes on the eve of the recipient addressing a joint session of Congress. During the reception, held in an enormous room with huge glass walls, it was difficult not to see the parallel between American and Ukrainian history at this point in time. Through the glass guests enjoyed a stunning view of both the harbor and the City of Boston. Several miles away among the streets where a large, modern city had grown patriots like Paul Revere furthered the cause of liberty. Now on this night many came to honor a man who risked his life to further freedom in Eastern Europe. Senator Edward M. Kennedy observed at the ceremony that President Yushchenko's "story is the story of honor, decency, and the will of the people triumphing over fraud, deceit, and intimidation. Because of his great courage, the rule of law prevailed against the oppressive rule of the powerful over the powerless. At a critical moment in his nation's history, he took a strong and courageous stand for what he knew was right. He risked his life, and nearly lost it, in the ongoing struggle for democracy in Ukraine." It has taken a long time, but Taras Shevchenko's hope as expressed in a poem has been met; Ukraine finally has its George Washington. Shevchenko is no doubt smiling from heaven. The next time President Yushchenko visits Shevchenko's grave he may wish to bring orange flowers. 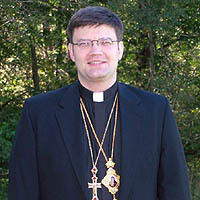 Bishop Paul Peter Jesep is Chancellor of the Archeparchy, Episcopal Vicar of South America and Syncellus for Public Affairs and Government Relations for the Church. He is a lawyer by training and former aide to U.S. Senator Susan Collins (R-ME). His Excellency has also studied at Bangor Theological Seminary, the third oldest such school in the United States. He may be reached at VladykaPaulPeter(a)aol.com.